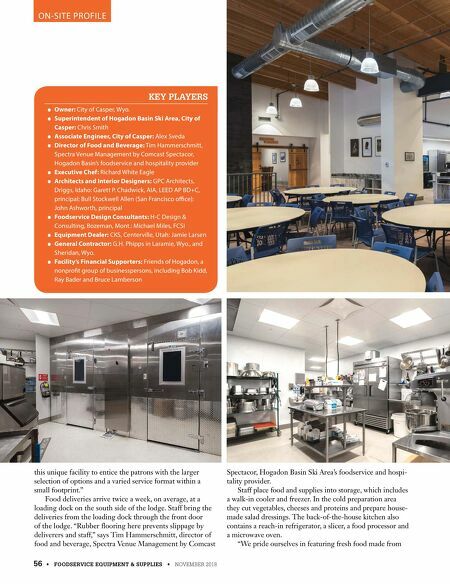 NOVEMBER 2018 • FOODSERVICE EQUIPMENT & SUPPLIES • 57 scratch," says Hammerschmitt. "We offer cook-to-order menu items on weekends. During the week, when there is less traf- c, we offer more grab-and-go salads and wraps." This kitchen area also features a tilt- ing skillet, a double-stack, a full-size con- vection oven, a 36-inch range, a 20-quart mixer and stand, a bun pan rack and a low-temperature cook-and-hold oven. The dishwashing area includes clean and dirty dish tables, a disposer and a warewasher that staff use to clean china and glass after events. "At the end of the dishmachine we have room to let two dish and glass racks dry at a time," Hammerschmitt says. Hogadon Café currently uses eco-friendly disposables. "Because of the cost of these products, we're switching to wrappers for burgers and sandwiches," Hammerschmitt says. 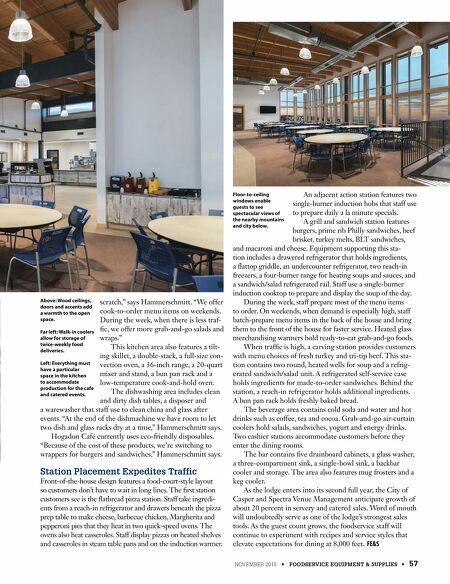 Station Placement Expedites Traffic Front-of-the-house design features a food-court-style layout so customers don't have to wait in long lines. The rst station customers see is the ˆatbread pizza station. Staff take ingredi- ents from a reach-in refrigerator and drawers beneath the pizza prep table to make cheese, barbecue chicken, Margherita and pepperoni pies that they heat in two quick-speed ovens. The ovens also heat casseroles. Staff display pizzas on heated shelves and casseroles in steam table pans and on the induction warmer. An adjacent action station features two single-burner induction hobs that staff use to prepare daily a la minute specials. A grill and sandwich station features burgers, prime rib Philly sandwiches, beef brisket, turkey melts, BLT sandwiches, and macaroni and cheese. Equipment supporting this sta- tion includes a drawered refrigerator that holds ingredients, a ˆattop griddle, an undercounter refrigerator, two reach-in freezers, a four-burner range for heating soups and sauces, and a sandwich/salad refrigerated rail. Staff use a single-burner induction cooktop to prepare and display the soup of the day. During the week, staff prepare most of the menu items to order. On weekends, when demand is especially high, staff batch-prepare menu items in the back of the house and bring them to the front of the house for faster service. Heated glass merchandising warmers hold ready-to-eat grab-and-go foods. When trafc is high, a carving station provides customers with menu choices of fresh turkey and tri-tip beef. This sta- tion contains two round, heated wells for soup and a refrig- erated sandwich/salad unit. A refrigerated self-service case holds ingredients for made-to-order sandwiches. Behind the station, a reach-in refrigerator holds additional ingredients. A bun pan rack holds freshly baked bread. The beverage area contains cold soda and water and hot drinks such as coffee, tea and cocoa. Grab-and-go air-curtain coolers hold salads, sandwiches, yogurt and energy drinks. Two cashier stations accommodate customers before they enter the dining rooms. The bar contains ve drainboard cabinets, a glass washer, a three-compartment sink, a single-bowl sink, a backbar cooler and storage. The area also features mug frosters and a keg cooler. As the lodge enters into its second full year, the City of Casper and Spectra Venue Management anticipate growth of about 20 percent in servery and catered sales. Word of mouth will undoubtedly serve as one of the lodge's strongest sales tools. As the guest count grows, the foodservice staff will continue to experiment with recipes and service styles that elevate expectations for dining at 8,000 feet. FE&S Above: Wood ceilings, doors and accents add a warmth to the open space. Far left: Walk-in coolers allow for storage of twice-weekly food deliveries. Left: Everything must have a particular space in the kitchen to accommodate production for the cafe and catered events. Floor-to-ceiling windows enable guests to see spectacular views of the nearby mountains and city below.